LOS ANGELES, California, May 13, 2011 (ENS) – A Texas high school student who invented an antipollutant device that fits into the exhaust of a car and uses algae to convert carbon dioxide into oxygen today was named the winner of the U.S. Environmental Protection Agency’s 2011 Patrick H. Hurd Sustainability Award. 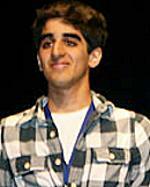 Param Jaggi, a senior at Plano East Senior High School in Plano, Texas, has applied for a patent for his device, the Algae-Mobile 3. The bioactive filter is a transparent canister that has gas permeable membranes as entry and exit ports. The carbon dioxide emitted by burning gas to propel the car comes in through the entry membrane and passes through a solution in the canister that supports a live colony of Chlorella algae. The algae carries out photosynthesis, which changes the carbon dioxide to oxygen and sugar. The oxygen is released through the exit port. The award was one of several announced at the Intel International Science and Engineering Fair in Los Angeles today. This year, more than 1,500 young entrepreneurs, innovators and scientists were selected to compete in the Intel International Science and Engineering Fair, the world’s largest high school science research competition. They were selected from 443 affiliate fairs in 65 countries, regions and territories, including for the first time France, Tunisia, United Arab Emirates and Macao. Matthew Feddersen and Blake Marggraff from Lafayette, California were awarded the top prize at the fair. They received $75,000 and the Gordon E. Moore Award, in honor of the Intel co-founder and retired chairman and CEO, for developing a potentially more effective and less expensive cancer treatment that places tin metal near a tumor before radiation therapy. Society for Science & the Public, a nonprofit organization dedicated to public engagement in scientific research and education, owns and has administered the International Science and Engineering Fair since its inception in 1950. “We congratulate the top winners for having the drive and curiosity to tackle these significant scientific questions,” said Elizabeth Marincola, president of Society for Science & the Public. “Their work, and the work of all of the finalists at the Intel International Science and Engineering Fair, demonstrates what students can accomplish when they are inspired to pursue inquiry-based research.